Meridian covers the basics as well as the details of change-in-control arrangements. 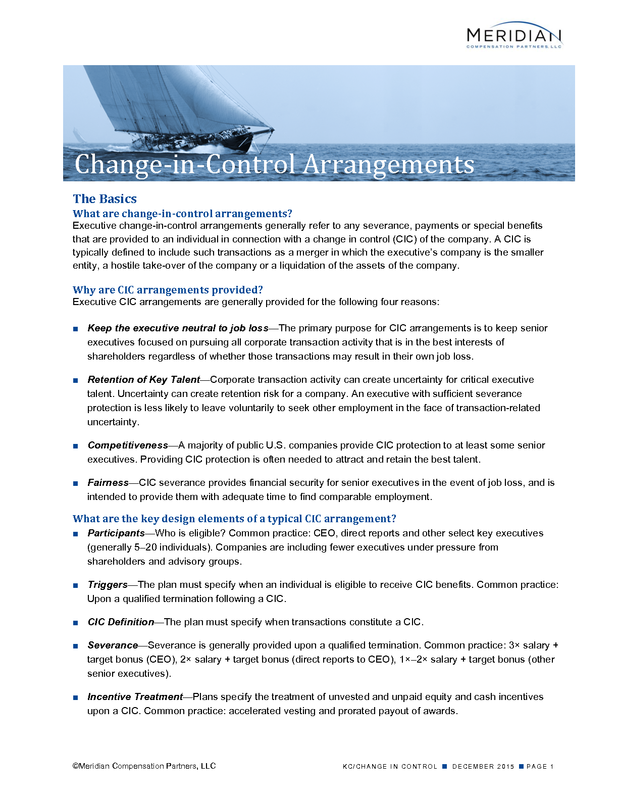 Executive change-in-control arrangements generally refer to any severance, payments or special benefits that are provided to an individual in connection with a change in control (CIC) of the company. A CIC is typically defined to include such transactions as a merger in which the executive’s company is the smaller entity, a hostile take-over of the company or a liquidation of the assets of the company. Why are CIC arrangements provided? Keep the executive neutral to job loss—The primary purpose for CIC arrangements is to keep senior executives focused on pursuing all corporate transaction activity that is in the best interests of shareholders regardless of whether those transactions may result in their own job loss. Retention of Key Talent—Corporate transaction activity can create uncertainty for critical executive talent. Uncertainty can create retention risk for a company. An executive with sufficient severance protection is less likely to leave voluntarily to seek other employment in the face of transaction-related uncertainty. Competitiveness—A majority of public U.S. companies provide CIC protection to at least some senior executives. Providing CIC protection is often needed to attract and retain the best talent. Fairness—CIC severance provides financial security for senior executives in the event of job loss, and is intended to provide them with adequate time to find comparable employment. What are the key design elements of a typical CIC arrangement? Participants—Who is eligible? Common practice: CEO, direct reports and other select key executives (generally 5–20 individuals). Companies are including fewer executives under pressure from shareholders and advisory groups. Triggers—The plan must specify when an individual is eligible to receive CIC benefits. Common practice: Upon a qualified termination following a CIC. CIC Definition—The plan must specify when transactions constitute a CIC. Severance—Severance is generally provided upon a qualified termination. Common practice: 3× salary + target bonus (CEO), 2× salary + target bonus (direct reports to CEO), 1×–2× salary + target bonus (other senior executives). Incentive Treatment—Plans specify the treatment of unvested and unpaid equity and cash incentives upon a CIC. Common practice: accelerated vesting and prorated payout of awards. Other Benefits—Many plans provide continuation of health and welfare benefits for one to two years, some plans provide other benefits such as additional retirement credits. Excise Tax Treatment—IRC Section 280G may apply a 20% excise tax to some payments. A small minority of companies now provide a gross-up for this excise tax. Gross-up provisions have been declining in recent years due to pressure from shareholders and proxy advisory firms. CIC arrangements generally provide for significant benefits and protections in order to keep executives neutral to job loss, encourage retention, provide a competitive employment arrangement and a fair transition following a termination of employment. CIC protections generally take the form of either a single CIC plan that provides protection to a group of executives, or individual employment contracts. The same level of benefits and protection can be delivered in either a plan or individual contract. The choice of format is often dependent upon a company’s philosophical approach to employment contracts, and administrative ease. Generally CIC arrangements should cover two categories of individuals: 1) Senior executives directly involved in seeking out and implementing strategic corporate transactions and 2) key executives that may be at particular risk of job loss in the event of a CIC. The first category of individual is typically limited to only a few executives, generally the CEO and a select number of others. Protections are provided to this group primarily to keep them neutral to job loss and aligned with shareholders. The second category is typically a slightly larger group of executives that may be a particular retention risk. Single Trigger benefits are those provided upon the occurrence of a CIC, with no other factors necessary. A very small minority of companies (<1%) have single-trigger cash severance benefits. Single-trigger vesting acceleration has declined dramatically because shareholder advocacy groups favor double trigger. Double Trigger benefits are provided upon a combination of a CIC and a qualified termination. The termination must occur within a window period following the CIC (typically 12–24 months). A qualified termination generally includes both an involuntary termination and a termination for “good reason”. Good reason is often defined to include a significant diminution in duties or responsibilities, a material reduction in compensation or a requirement to relocate outside the current location of residence. Double triggers are the most common approach for CIC severance benefits (over 90% of companies). Modified Single Trigger is a hybrid of the single and double. It allows the executive to voluntarily terminate during a specified period following a CIC and receive CIC benefits, typically the 13th month following the CIC. The rationale for double trigger is that the acquiring company needs to retain the executive for a period following a CIC (i.e., 12 months) and, after that period, the individual should be able to leave with severance or force the company to renegotiate a new employment arrangement. These types of triggers are used by only a small minority of companies. Merger—A merger in which current shareholders comprise less than 50% to 60% of shareholders following the merger. Hostile Takeover (share acquisition)—An individual or entity attempts to take control of the company through purchasing a significant percent of the common stock of the company (typically 20%–30%). Hostile Takeover (board takeover)—An individual or entity attempts to take control of the company through a proxy battle to control the board. Generally defined as a change in 50% or more of current directors. Liquidation—The sale or liquidation of substantially all the assets of the company. Severance is typically expressed as a multiple of “pay”, with “pay” most often defined as salary and target bonus. Some companies will use a different bonus determination such as an average of recent actual bonuses. Many companies will have various tiers of participants with varying severance multiples for each tier. A multiple of 3× pay is most common for the CEO. For the next highest tier, which generally includes the CEO’s direct reports, a multiple of 2× pay is the most common. Historically, the majority practice has been for companies to fully vest and settle long-term incentive awards solely upon a CIC (i.e., single-trigger). However, over 60% of companies in Meridian’s 2014 study of CIC arrangements vest equity incentives double-trigger which requires either a qualifying termination of employment following a CIC or a failure of the acquiring company to assume or replace the unvested awards. Time-based equity incentives such as stock options and restricted shares are generally fully vested. Performance-based stock or cash incentives are typically determined based on target performance and 2/3rd pay out in full and 1/3rd pay out a prorated number of shares for the period of time completed. Most companies provide for the continuation of health and welfare benefits for a period of time following a termination. Most companies match the time period for continuation with the severance multiple (i.e., 2× = 24 months continuation). Some companies have moved to a fixed 18 months of continuation regardless of severance multiple. A minority of companies will provide other benefits upon a CIC, such as the crediting of additional age and service to a retirement plan or the continuation of perquisites post-termination. Full Gross-up—Excise taxes are fully grossed-up by the company with no cost borne by the executive. While this practice was historically the most common, it is under increasing pressure by shareholder advocacy groups, and is vastly decreasing in prevalence. Modified Gross-up—Excise taxes are grossed up if the individual’s parachute payments exceed the IRS limit by more than a specified margin (typically 10%). Otherwise, they are capped at the limit. This approach avoids a company bearing the expense of a gross-up if the individual is only over the limit by a small margin. Shareholder groups do not distinguish between full and modified gross-ups, both are decreasing vastly in prevalence. Alternate Cap (Modified Cutback)—No gross-up is provided. If the individual is better off going over the IRS limit and paying their own excise taxes, they are allowed to exceed the limit. If they are better off capped at the limit, they are capped. This method has become the most prevalent. Cap—Payments to any individual are capped at the IRS limit.